In A History of Chess (1913) Murray gives reasons for believing this Persian manuscript may be due to Ala’addin Tabrizi, the leading player at the court of Timur (1336 – 1405). A translation by Duncan Forbes (1860) is subtly different, referring to ‘one quarter of the board’ rather than a 4 by 4 board. The wording is critical, since a closed tour is possible on one particular non-rectangular quarter-board. Numerous manuscript copies of collections of chess problems survive that were written before 1500, when the rules of chess changed to replace the short-range fers and alfil of the mediæval game by the long-range queen and bishop of the modern game. 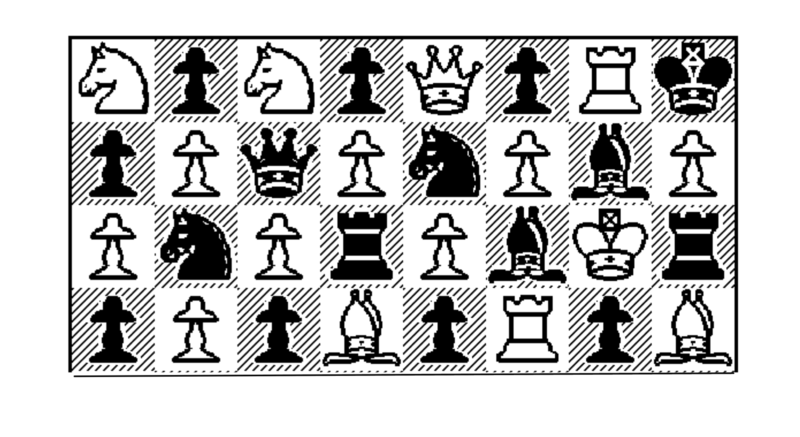 Most of these include at least one knight’s tour problem, often on the half chessboard. The earlier European collections from around 1250 are attributed to a compiler known as ‘Bonus Socius’ meaning Good Companion. One of these manuscripts, written around 1350, and now in a Library in Paris, is unusual in that the scribe of the manuscript is identified. He was Nicolas de Nicolai, a scholar from Picardy who studied and lectured at the Lombard universities in Italy. As was the custom, he presents a knight’s tour problem in the form of an arrangement of the 32 chessmen in the upper half of a chessboard. The white knight in one corner is to capture the queens, bishops, knights, rooks, pawns and finally the kings. Try to solve this yourself.